The Metro app is quite handy for finding out what’s happening on the train network, and can send notifications/alerts to tell you when something’s affecting the line(s) you use regularly. As previously noted, it’s not perfect — the SMS alerts that it replaced were customised to your specific station, so you didn’t have to try and work out if the 7:21 stops at your station — and at what time. But anyway, I was puzzling over how to make the notifications stop. Unless your phone is silent, they cause a beep (which apparently can’t be turned off) and fill up your status bar thingy if you don’t keep attending to it. If you try and add the same line again, it ignores the option to turn notifications off. I asked around on Twitter, and other people were having this problem too. Not so good: Take the IT Crowd’s catchcry of “turning it off and on again” to the next level: Uninstall the app, then add it again. You’ll have a clean slate, and you can add your line(s) again. Better: go to My Alerts, press and hold on the line you want to change. After a second or two you’ll see an option to delete it. Do so. Then go back and add it again with your preferred options. There’s been some suggestion from one user that a network-wide alert might sneak through with a notification even if you have all individual lines turned off. Not sure about that. While the app does provide welcome information of problems (I’d rather know than not), they probably need to do some work on it, particularly around options for specific station times and alert tones (or not). Meanwhile, tram users have Tram Tracker of course, and bus users… well, they’re still waiting. Long term PTV should probably be taking the lead and being the conduit for all service information, regardless of operator, perhaps organised by area instead. For instance it would be useful to know if that power fault affecting train signals and boom gates has also affected the local buses you might use as an alternative way home. I use this app as well, but one aspect I find irritating is that when I connect (3G or Wifi) the app sends me all notifications since last time I connected, even if that was three days ago. I don’t travel everyday, so I don’t have my 3G on all the time. And don’t forget Tram Hunter for Android, around long before Tram Tracker for Android, and it is simple and fast. Is it about time we rename the lines as colors and numbers like the rest of the world? Especially when the Metro Tunnel gets built. Another option is system settings->apps->Metro Notify and clear the ‘show notifications’ checkbox. A homescreen widget to show the direction of the city loop lines. 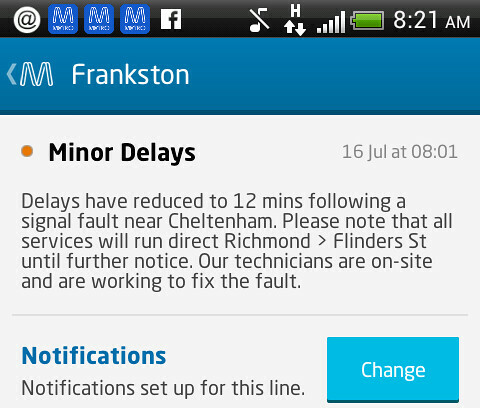 Also shows the metro line status. 1. 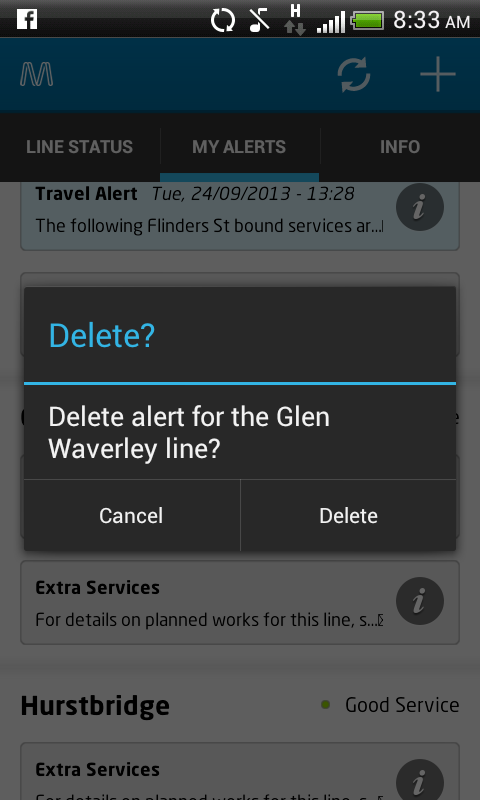 I get the same alert for both Belgrave and Lilydale lines.. should be smart enough to know to alert just once. 2. The notification popup on my Android phone only shows a line and it cuts off most of the alert.. so you don’t know what’s going on. It should wrap the line to show the whole alert. Instead, you have to click it and load up the app, and there’s probably heaps of other people doing it at the same time so their server is overloaded and it won’t load. What’s the point of push notifications if it means you still have to go fetch basic information from the server?